New York, NY KM Associates is celebrating 20 years as one of the city’s premier building code, zoning consulting, and expediting companies. 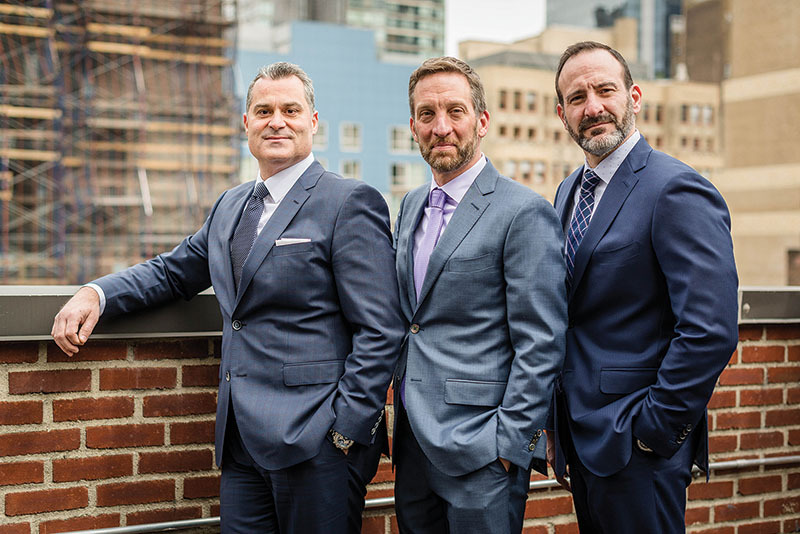 The three partners—Philip Santantonio, RA, AIA, Vito Gerbino, and Adam Matty—are all trained in architecture, but they developed their vast expertise in this demanding and detail-oriented business by working in nearly every facet of the building industry. Though they have grown the company to 60 people, the partners remain true to their founding principles. They continue to work primarily in the city, where they have a deep knowledge of the workings of city agencies and of the complex and arcane codes and regulations that govern—and often constrain—building design and construction. And all three are directly involved with every client and in every project: as much pride as they take in the success of their business, they take at least as much in contributing to the success of their clients. On the occasion of KM Associate’s 20th anniversary, the partners explain their success and what comes next for their innovative company. How did the three of you come to establish KM Associates and what did you see as the need for your services? Gerbino: After getting our degrees in architecture, we went to work individually in architecture, expediting, construction management, and real estate development. We realized that, even though expediting is critical to a project’s success, it didn’t have a seat at the process table–it was a series of stand-alone steps, not a strategic partner. In starting KM Associates, we wanted to change that. What people think of as expediting—getting approvals and permits quickly—is really the simplest step. It’s knowing what’s needed, where that fits in the schedule, how long something takes, what person at a city agency will take your call—those are the elements that make a difference. That’s where our experience and knowledge come into play. We partner with the project team from day one, and we’re on the job through to close-out. We review the construction drawings for compliance; if there’s a problem, we can suggest changes to the design or interpretations of a code that the Department of Buildings (DoB) is likely to accept. We’re there for every project milestone and the inevitable changes in design or materials or methods. We like to say that we’re multi-lingual: we speak client, architect, engineer, construction manager, and city bureaucracy, so we can facilitate and interpret and help everyone get the best result. With our training, experience, and expertise, we’ve made the business of expediting a profession. What are some of the highlights of the last 20 years? Matty: One of the things we’re proudest of is the long-term relationships we have with many of our clients. We began partnering with Verizon back in 1998, for example, and when their landmarked building was severely damaged on 9/11, we helped facilitate a meeting between that company’s leadership and the DoB commissioner, who told us she would see to it that we got whatever we needed to get the phone lines going again. Verizon still counts on us today for strategic code consulting, as well as expediting. When Hurricane Sandy hit the city, we got involved in “Build It Back.” So far, we have worked on some 500 homes. We set up a special team just for this work, which is really tricky. There are new flood maps, so structures that weren’t in the flood zone now are; and while the houses have to be raised above flood level, the zoning limits the height of any structure. That requires a lot of interpretations of the zoning and codes. Now we’re working at Hudson Yards, which calls for very sophisticated interpretations: special purpose zoning was developed just for that district, so there’s a lot of gray area. If there are conflicts between the special purpose regulations and the underlying zoning district, which one governs? Our job is to come up with an interpretation that the DoB agrees will meet their requirements in a way other than what’s strictly specified. Our understanding of the intent behind zoning and codes, combined with our architectural and construction expertise, can have a big influence on a project. Sometimes, we’ll make a recommendation to reconfigure space that results in lower construction costs and more rentable square feet for the developer. What are some of the big changes in your industry? Santantonio: One word, technology. Our industry has been really heavy on paper. Every piece of information has to be documented. We were among the first to implement a proprietary digital tracking system to monitor the status of all our projects. Now we’re launching a new system that provides more and better connectivity. It represents a significant advance in increased efficiencies and improved process flow. Accuracy is everything, so we have a rigorous training process for all our new employees. Our new system will be linked to DoB NOW, the New York City Department of Building’s new system being rolled out in phases. I’m a board member and one of the founders of the New York Coalition of Code Consultants. Together, we’re the biggest end-users of the department, so we offer our services as they decide exactly what they want to do. Of course, no technology can replace personal relationships. Ours is a people business–our partnerships with clients depend on their trust in our competence and integrity and our commitment to serving their interests. “To expedite” may still mean “to speed things up.” But for KM Associates, it also means to facilitate, to perform efficiently, to free from entanglements and make ready. Every service they offer contributes to the company’s defining purpose: moving projects forward.